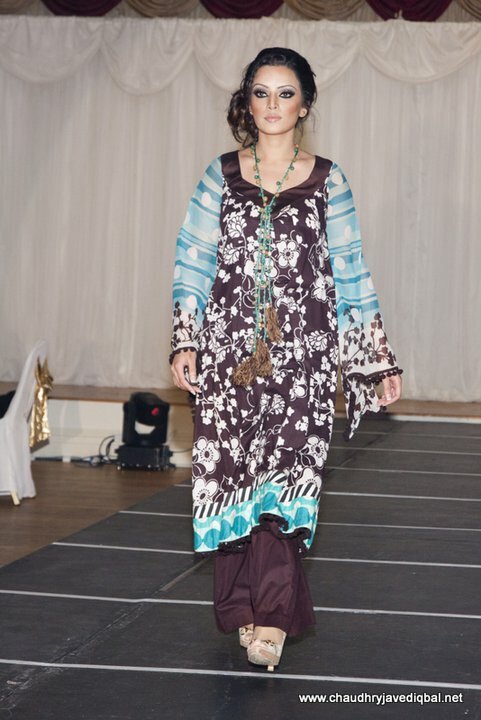 Here's part 2 of the Maria B charity fashion show which took place in Manchester with proceeds going to the International Foundation for Mother and Child Health. This part of the show was composed of the long-flowing style outfits worn with wide trousers. I still haven't been converted personally to this style, but I have to say these types of suits were worn by a lot of the audience at this event too. For anyone interested in the make-up and hair at this event, the team included my go-to make-up artist Huda Ahmed, for more info you can contact her via her facebook profile. I *think* anyone wearing this next outfit in the real world would probably wear a slip underneath this one!